As I mentioned in my New Year's post, I want to get back to drawing and working on long dormant projects. To say the least this year has been year of changes for me as my family and I moved from sunny Los Angeles (Glendale, CA, actually) to cold, snowy Rochester, New York (we love the change of seasons, so it feels great to be here). But any move is very destructive to creative flow. It takes a while to get settled. I'm still not there yet, but working on it. 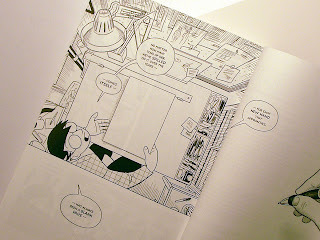 But to help thing along I picked it Scott McCloud's "Making Comic" book. 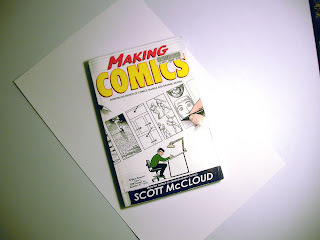 It's a fun read and especially for me as a way to get back to basics of drawing for fun, again. Comic art was my first creative love and I miss not doing it. 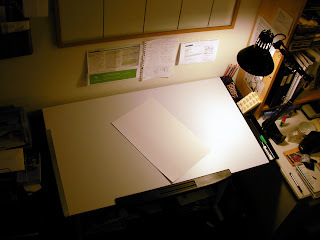 So, I brought a new drawing table and was shocked to realize it's the first I've had in over ten years. I done a lot of storyboard work on company art desks, or just leaning a drawing board on a desk at home (a computer desk, of course). But what really, as I finished setting the new table the last image of the McCloud book struck me, as being all most cosmic. In comparison, here my art desk. Now, all that left is to start. That blank page can be terrorizing. I know a lot of artists go through this (creative dry patchs). For me, it's like having a fear of holding a pencil, again. I know I can draw, I have old drawing to prove it. In, fairness, my creative energies were channeled to my flip books stuff. But, now, I feel it's time to get back to drawing and take it to the next level. I definitely want to explore the digital medium. But, first things, first. The blank paper and a pencil. Wish me luck,I'll keep you posted. First, I hope everyone had a great holiday season, and here's wishing you a very Happy New Year. It's time for New Year resolutions, again. I, for one, like to make New York resolutions, if done in a positive way. I see it as just setting new, or revised, goals for yourself after some self reflection. Just, don't beat yourself up if you fall short of your goals. There's always next year. One of the easiest way to gauge yourself is to look at last year's New Year's resolution. My two resolutions were to revise my blog, and pick up the guitar again. I'm happy to say, I did both pretty well. I've been posting more to this Dragonfly Views blog than my other web sites and really enjoying it. I thank all the people viewing this blog from all over the world. As for the guitar playing, I'm still at it. I play, at least, 10 minutes a day and more when time allows. I've started working on a music project, Warped Sky - Stray Cloud, a combination of songs from old tapes and new renditions of original tunes. Mostly it's for my friends, Richard and Rodney, the old Warped Sky band. But I think I'll post it online at some point. To get back to drawing, for fun, and profit. Generally, put down some of my original ideas in more concrete forms like storyboards, animatics, model sheets, etc. Also, make better use of my website and blog to get the Dragonfly Flipz off the ground. To that end, I'll be offering a download version of some of my Dragonfy Flipz books soon. I thinks that enough for this year. Please check in often and I'll keep you posted.